After about 10,000,000 requests, Apple has finally given in and delivered the super-basic feature that the iPhone has been missing since day 1: cut and paste. Took you jerks long enough. Here's how it works: you double tap on a word to present a cut, copy, paste popup. Two draggable icons appear for customizing the selection. Double tap in an empty space to bring up the cut, copy and paste bubble and paste it in. Double tap again to select again, select entire block of text and paste again. Easy as pie. You hold your finger down on an entire paragraph to select it. If it's got rich formatting, such as links or bold text, it'll copy it all for you. You can copy and paste across all apps, including web content. To undo, simply shake the phone. It looks like they really did it right this time. 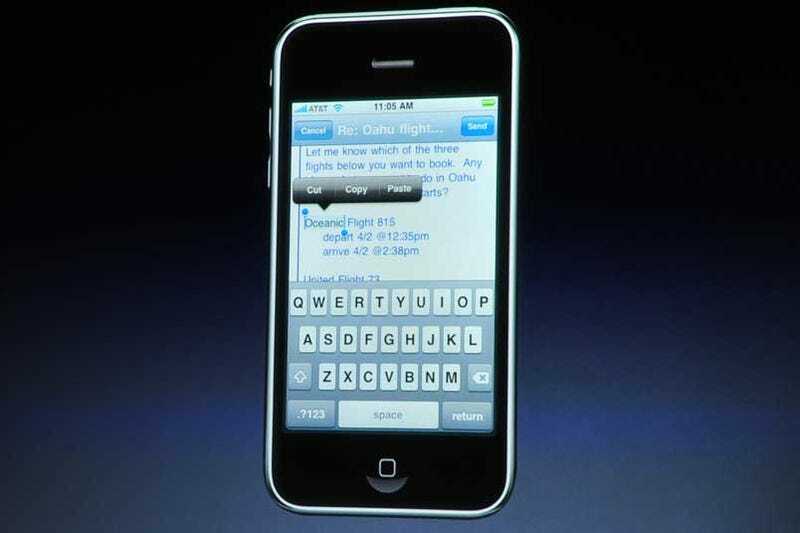 It took so long, according to Forstall, because "it's tough to navigate security issues and nail a simple UI." Mmkay.